Students will learn about the history of the Labor Day holiday. Students will write a newspaper about the history of the Labor Day holiday in the United States. Students will learn vocabulary words from the The Story of Labor Day article. Working in small groups, have students look up the following vocabulary words in the dictionary and write down their definitions. (collective bargaining, labor union, guild, dissidents, contentious, nefarious). Ask each student to read The Story of Labor Day article. Starting with the following question, discuss the article as a class. What did Peter McGuire mean when he said that the purpose of Labor day was to celebrate those "who from rude nature have delved and carved all the grandeur we behold"? Generate a list of topics about Labor that interest the students. 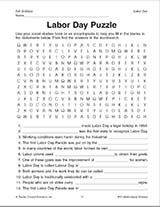 Assign each student one of the topics and ask him/her to write an article about it for a class newspaper about Labor Day. Encourage students to look for additional information in books or on the Internet. Before the students begin writing, remind them that writing for newspapers is different than other types of writing. The point is to get the information across to the reader quickly. Therefore, newspaper articles always include the most important facts (who, what, where, when and why) in the first paragraph of the article. The details and background should be included in paragraphs that appear later in the article. Once each student has written his/her article and it has been edited by the teacher, ask students to put the result together into a newspaper. This can be done electronically or it can be done using paper, transparent tape and a copy machine.